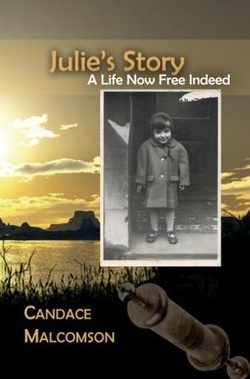 "Julie's Story - A Life Now Free Indeed"
written by Candace Malcomson, published by Ambassador International, available at your local Christian Bookshop from the end of September 2011 or on Amazon. . . He shall make you free indeed! Julie's story is the story of an abused life which defied death time and again. It is the story of a criminal, drug addict and dealer, converted, delivered and set free. It is also the story of a backslider who returns and is restored by the love of her Heavenly Father. The battle over the old-man is won and the downward spiral of sexual promiscuity is halted forever. “How precious is the flow that makes me white as snow. This will be a testimony to challenge every sinner to turn to Christ for Salvation, and every saint to walk with Christ with a burning heart and with a desire to win souls to Christ. We hope that as well as being used in evey sphere of life that the Lord will open many doors into prisons that this book may give hope in Christ's redeeming Blood and mighty power to save from sin. We would encourage leaders and churches to consider buying a box of books for outreach purposes, particularly those who may work in PRISON MINISTRY. "Julie's Story — A Life Now Free Indeed" is Published by Ambassador International, available on Amazon and in all major Christian Bookstores across the USA, UK and Ireland soon.